As technology evolves, so does the compliance landscape; and keeping up with the trends can prove to be quite a challenge for many businesses. With lawmakers and regulators constantly making certain definitive changes in policies (MiFID II and GDPR), companies must continue driving the effectiveness and efficiency of their risk and compliance programs to meet the applicable laws, regulations, and supervisory guidance. 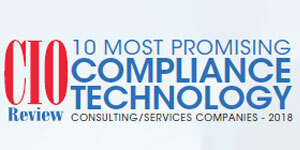 And in most cases, firms find it arduous to make changes to their compliance programs. Fortunately, many consulting companies are coming up with innovative services and solutions to help achieve the compliance requisites that the organizations covet. These services companies identify and address legal and regulatory compliance requirements and implement a compliance management process for effective oversight. As regulatory compliance experts—with a team of consultants, leading lawyers, former regulators and experienced governance, and risk and compliance practitioners—these firms leverage best-of-breed technologies and act as a constant guide to an organization’s compliance management undertakings. By keeping an eye on the major areas of innovation, compliance consultants help prevent enterprises from straying too far in the compliance path, avoid breaches and fines, and ultimately keep the clients and their data safer.